Latin percussionist Amando Peraza (89) died April 14. No information was reported on place or cause of death as reported by several news agencies. Armando Peraza was born May 30, 1924 in Havana, Cuba. His first gig as a percussionist was on the island with local bandleader Alberto Ruiz. After performing with other Cuban outfits, Peraza came to the United States via Mexico in 1949, settling in New York City. Excelling at both congas and bongos, he found work quickly within the city’s vibrant Latin music and jazz communities. His earliest recording and performing dates in the U.S. included sessions with Charlie Parker and Slim Gaillard. Beginning in 1957, Peraza joined the band of George Shearing, with whom he remained for 12 years, appearing on nearly two dozen albums by the British pianist. 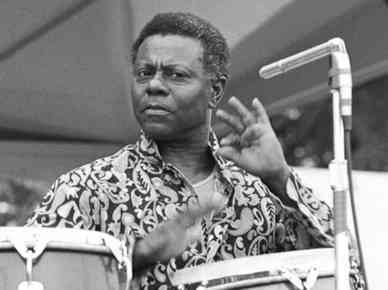 He also recorded with Mongo Santamaria during this period, then joined Tjader’s band in the early ’60s for six years. Other dates at the time included high-profile gigs with Judy Garland and Stan Kenton. Peraza rarely served as bandleader, but he did release a solo album, Wild Thing, in 1968, among whose personnel was a young Chick Corea. Peraza was already 48 when he joined Santana, playing on all of the group’s recordings of the period and in concert around the world. He also wrote 16 songs that were recorded by Santana. 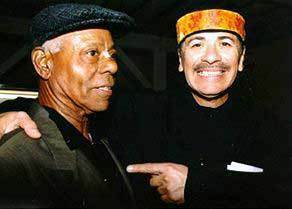 Other artists whose recordings featured Peraza included Art Tatum, Machito, Josephine Baker, Aretha Franklin, Jaco Pastorius, Linda Ronstadt, Frank Zappa and Rick James.